Have some 3GP videos stored on your smartphone or computer's hard drive? Looking for easy to burn them to DVD disc so that you can watch them on and standard DVD player or TV? Here we'll talk about how to convert 3GP to DVD easily and quickly with a versatile DVD burning tool. Aimersoft best DVD making software can be the best choice for you to burn 3GP to DVD with personalized DVD menus. In addition, it comes with a built-in video editor that allows you to touch up your videos by trimming, cropping, rotating, etc. in clicks. Apart from 3GP, this DVD burner can also burn MP4, AVI, WMV, MKV, MOV, FLV, etc. to DVD disc with fast conversion speed and high output video quality. If you are using a Mac, you can turn to the equivalent Mac version called Aimersoft Mac DVD Creator. Now download this fantastic program and follow and guide below to create DVD from your 3GP video files. This guide uses DVD Creator for Windows screenshots. The way to convert 3GP to DVD on Mac OS X (including Mountain Lion) is the same. Just make sure you've downloaded the right version. Run DVD making program and click "Import" to select and import the video files you want to burn to the program. You can also simply drag and drop the videos to the DVD burner. You can preview the loaded video files in the right viewing window and take snapshots of your favorite movie scenes. 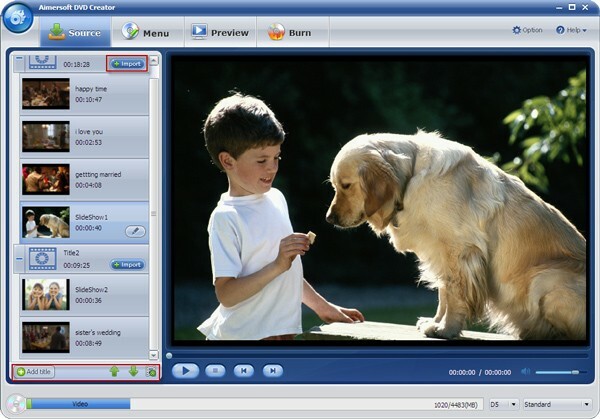 This DVD burning tool offers some video editing functions to let your personalize your videos. To edit a video, select it and click the "Edit" button beside it, then you will see the "Video Edit" window, where you can crop, rotate, trim videos, etc. Various free DVD menu templates are provided for your choice. Go to "Menu" tab and select a DVD menu template you like and then customize it with your favorite photos, music, buttons, frames, etc. If you don't want to apply a DVD menu, you can simply select "No Menu". The last step is to insert a writable DVD disc into your computer's DVD drive, go to "Burn" tab and follow the instructions to set your burning parameters, then click "Burn" to begin burning 3GP to DVD disc. If you don't want to convert 3GP to DVD directly, you can save them as an ISO image file or DVD folder. Convert Memory Card to DVD: This tutorial is going to instruct you to convert videos in memory card to a DVD disc. Convert WebM to DVD: How to convert WebM videos to DVD? This article will teach you step by step. Burn WTV to DVD: Lingering on the question on how to burn WTV videos to DVD? Find the solution here.